GBPUSD extended its upside movement from 1.3039 to as high as 1.3359, breaking above 1.3337 key resistance. 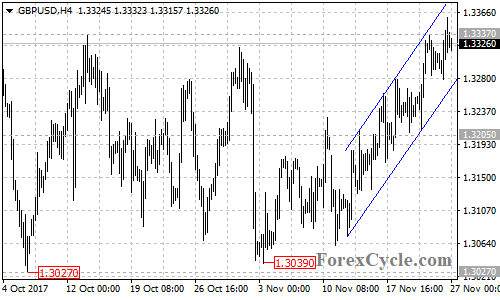 As long as the price is in the rising price channel on the 4-hour chart, the upside movement could be expected to continue and next target would be at 1.3420 area. Above here could trigger further upside movement towards 1.3657 (Sep 20 high). On the downside, a breakdown below the channel support could bring price back to next support level at 1.3205. If this level gives way, another fall to test 1.3027 support could be seen.